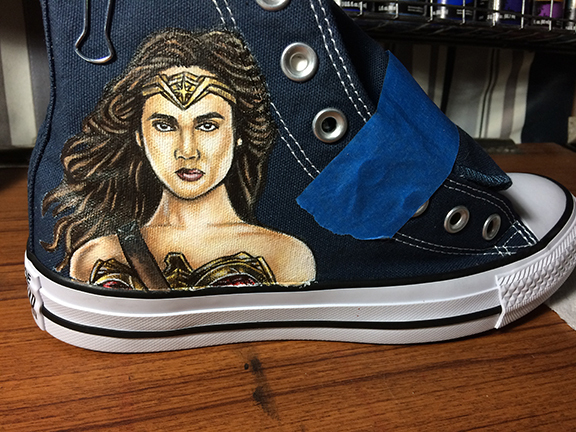 Wonder Woman custom shoe 2 is all finished up. In this last stage of my process, I finished the hair up and the went back an added a few more highlights to the overall painting. 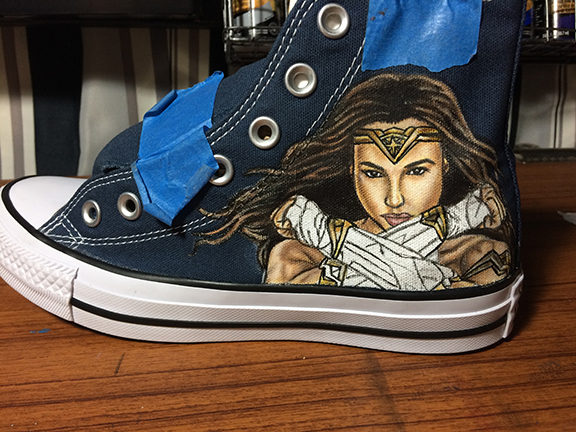 Wonder Woman custom shoe 2 process stage 3. The metal and leather strap was achieved by laying down the base color/flats in the digital world of painting. With the base colors finished, now I build up the values up slowly by going back & forth layering darks, midtowns and lights. I continue this painting stage with my crushes of choice and the technique mention in previous posts for this artwork. 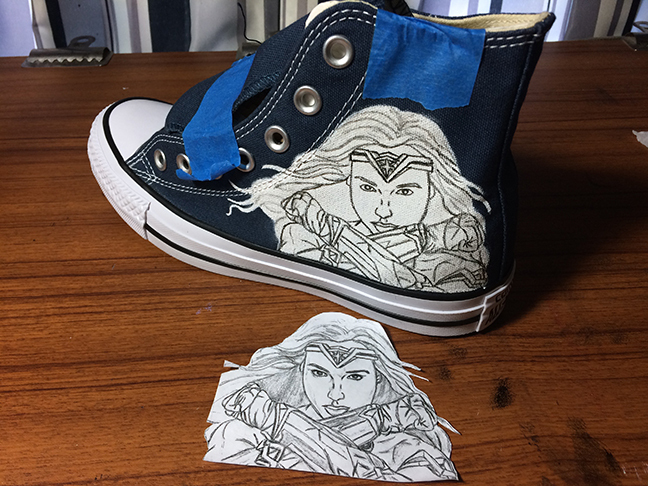 Wonder Woman Custom Shoe 2 process stage 2. The face and body are achieved by laying down the base skin tone color or flats in the digital world of painting. Once the base color is done, I start building up the values by going back a & forth layering of darks, midtowns and lights. Main technique used is dry brush. The brushes I used for this stage are the 5, 10 & 18 spotter, size 2 angle shader and chiseled blender. 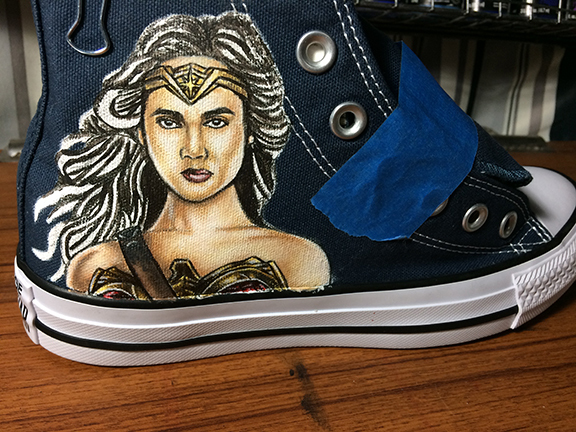 Wonder Woman custom shoe 2. Here is the process for custom shoe 2. The main image area for the second shoe is primed, pencil drawing transferred and ready for the painting process. 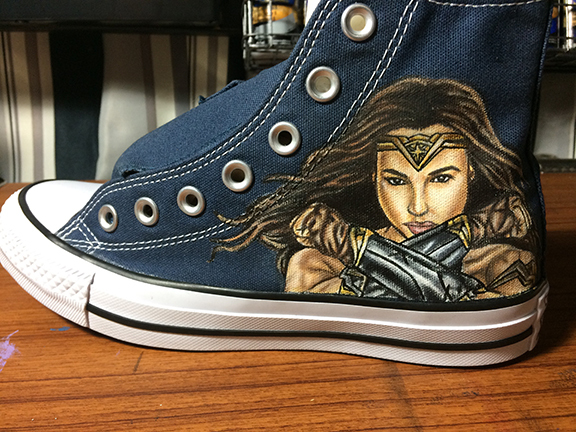 Wonder Woman Custom Shoe 1 is all finished up. This stage 3 of my process. I added the gray metal to the gauntlets and brown to the hand wrap. After all the painting is done.I went back and added a few lighter tones to some areas to complete shoe number 1. Up next will be shoe number 2. 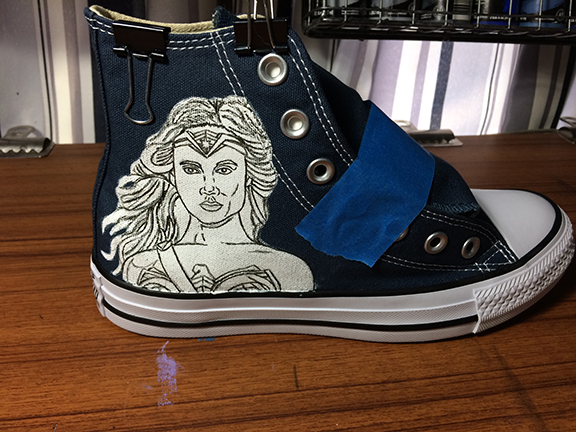 Wonder Woman custom shoes progress stage 2. The face, body, hair and gold metal is achieved by laying down the base colors or flats in the digital world painting. Once base colors are done next up is building values by going back & forth layering of darks, midtowns and lights. Main technique used is dry brush. The brushes I used for this stage are the 5, 10, & 18 spotter, 1/8 angel shader and chiseled blender. 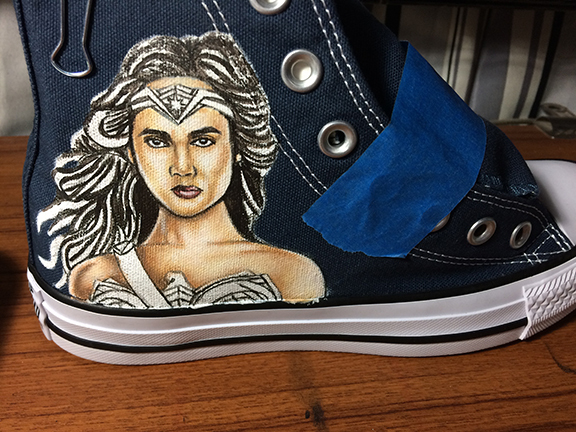 Here is my painting process for Wonder Woman Custom Shoes. This is first of the two shoes. The main image area for the first shoe is primed, pencil drawing transferred and ready for the main painting process. 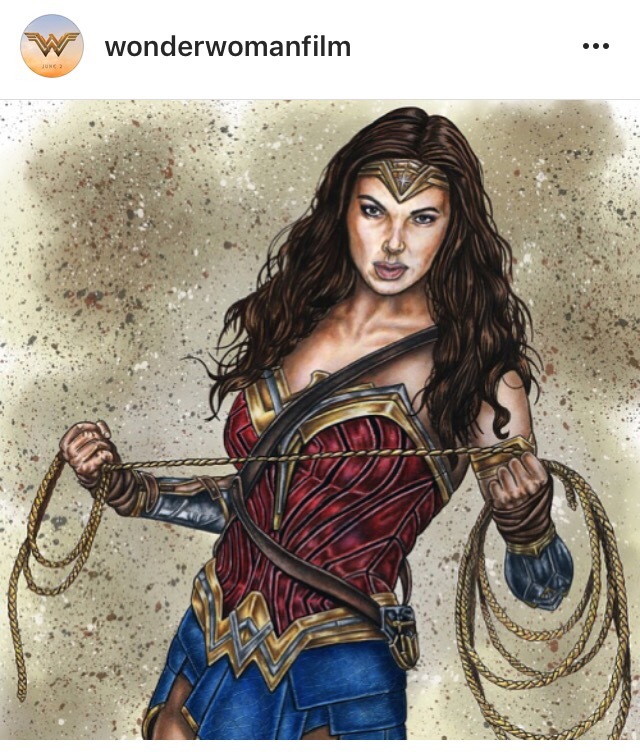 Celebrating #WonderWomanDay and the release of the Wonder Woman Movie with this Gal Gadot artwork. 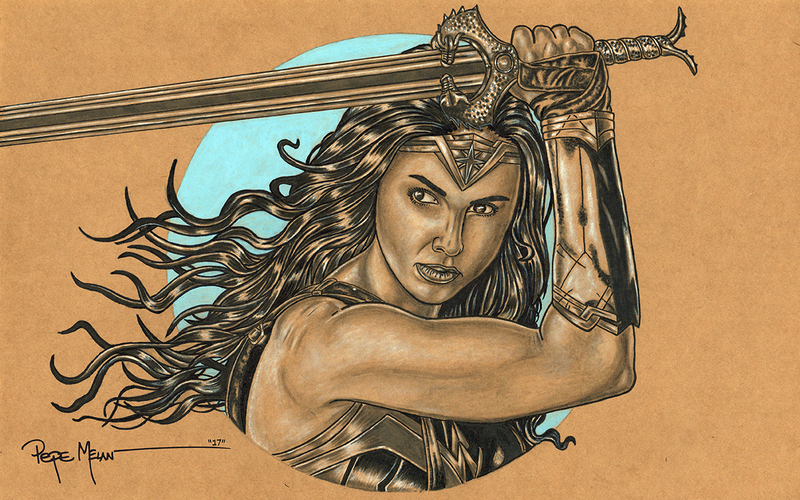 It was rendered with Copics and Liquitext on Kraft Toned Paper. Please share with your friends and family! 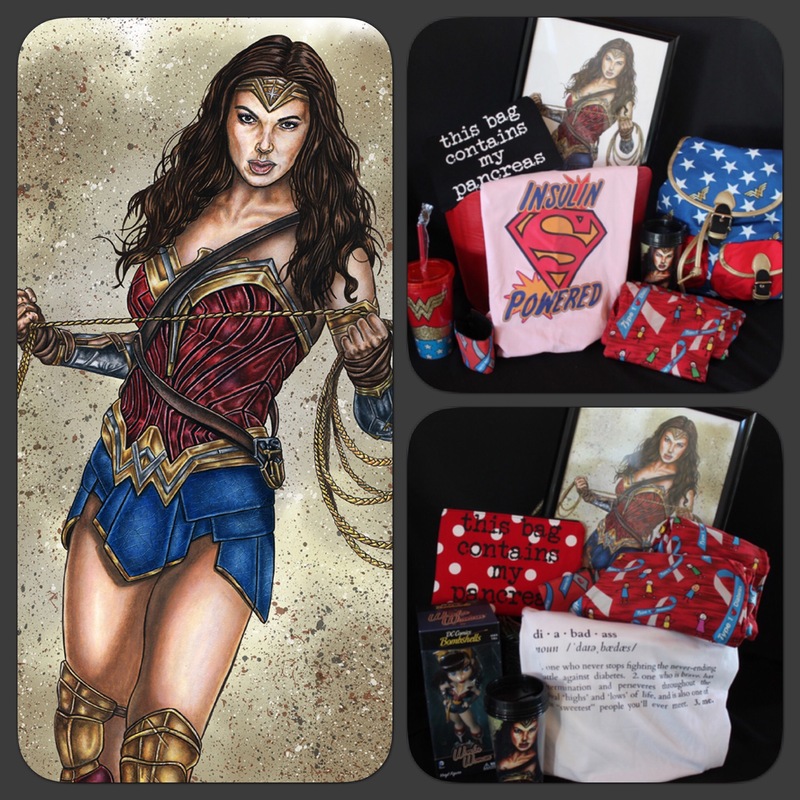 Thanks for all your help and support with this awesome cause & charity auction!! !